It's time to update an item about my nemesis George Porter (thanking my stars he's not MY ancestor). For an essential backgrounder, see my post several years ago about "Berkeley Castle." George certainly didn't know it, and no-one else seems to know it, but archaeologists are calling his Town of York cabin "Toronto's first house"!! In a CBC TV news item aired 24 September 2013 archaeologist Keith Powers referred to the site with its evidence of an underlying log structure as the first house in Toronto (meaning York, Upper Canada). Yup, not one of, but the first house. 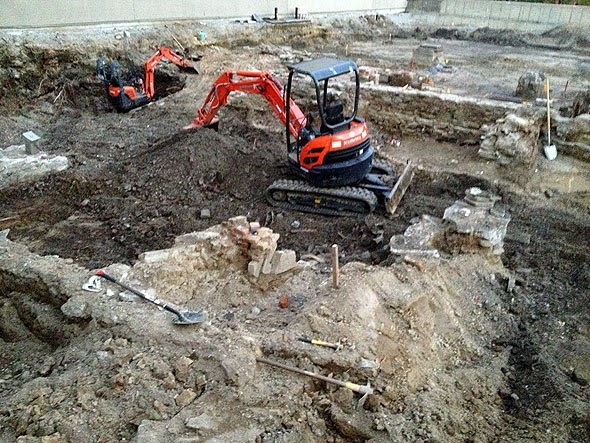 Archaeologists were excited to reveal their findings last month at a construction site on King Street East at Berkeley. Online news outlet BlogTO followed with the story a week later. The property under construction is for the new offices of The Globe and Mail. The site is heavily barricaded at street level but BlogTO gives us a peek at the stone foundations of Berkeley House, home of John Small (1746-1831), clerk of Governor Simcoe's executive council. Archaeologist Powers says Small purchased the site in 1795 with a log cabin already on it. "A fishing cabin." ... Not exactly! But yes, indeed, the purchase was 31 August 1795 for a sum of $50. (1) But no-one mentions that it was George Porter's log house (for that sale price he had also agreed to shingle it for Small). George was a productive, in-demand carpenter from the earliest days of building York; I doubt he considered his house a fishing cabin. George was in York for such a relatively short time, his name has been almost lost; whereas John Small was a firmly planted member of the establishment, a top ranking civil servant. So the log house likely predated 1795, possibly back to York's founding in the summer of 1792: after all, the busy carpenter had to have a place to live for three years while while employed in town construction. The transfer from Porter to Small is outlined in minutes of the executive council's land committee, in Small's petitions submitted after the fact. (2) Awaiting government delays in confirming his location, Small lived in the log structure adding improvements; his plan was to use it as a stable when his new residence was finished. By 1795 the parliament buildings aka Government House, Small's place of work, were located diagonally south across Palace/Front Street, only a few steps from his residence. 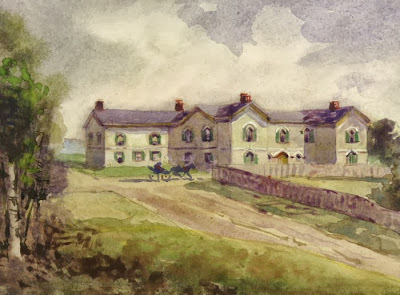 Berkeley House pastel attributed to Owen Staples ca.1912, said to be based on a drawing ca.1888, based on a sketch by Mrs CC Small in 1830; image Toronto Public Library, Baldwin Room, JRR 693 Cab. Charles and family lived for many years there in one of Toronto's showcase homes; his wife made what is probably the earliest sketch. Berkeley House became derelict in the next century and was demolished in 1925. Let's ensure we keep the history straight. Even if he is a most annoying man (as my previous posts demonstrate), George Porter's name should be attached to "Toronto's first house" ! (1) Edith Firth, The Town of York 1793-1815 (Toronto: Champlain Society/University of Toronto Press, 1962), 223; citing Ridout Papers at Archives of Ontario. (2) Upper Canada Land Book F, pp. 359-361 (1805); Library and Archives Canada microfilm C-102. The entry includes copies of Small’s petitions dated 12 June 1800 and 28 August 1801. (3) Henry Scadding, Chapter 6, "King Street: George Street to the Bridge and Across It," Toronto of Old (1873; reprint Toronto: Dundurn Press, 1987), 138. You might find this map by the Surveyor General DW Smith of interest, in relation to your discussion of John Small. I came across it while digging for other maps of early York. Joan Winearls (Mapping Upper Canada) describes the map (#2030): "Accompanies a letter from Smith to Lt Gov Hunter of 25 May 1802 explaining the origins of Small's claim (OTMCL DW Smith Papers B-9 p311); shows Small's improvement on King St east of Princess and Ontario sts; the two wings of the first Government House are sketched to the southeast..."
ps. Mr. Anderson: The name 'Joshua Leach' shows up on DW Smith's 1797 plan of York—look north west of the lot assigned to the hospital. Thank you for visiting, Nathan. I am familiar with this map from the DW Smith Papers (documents there also reinforce the fact that George Porter built the log house). Let me say I very much admire your website (http://oldtorontomaps.blogspot.ca/), a great online resource for history fans!